Thread Bear's Picnic - www.aoibheni.com: Colour-changing in crochet. These days, when I've no access to my computer, I'm working on more portable projects. I found myself, almost by accident, working on a long-considered hoodie pattern the other day. As it stands, I now have a sleeve, half of the button-up front and 70% of the back panel done. It's stripey. So, that's a lot of stripes. I figured, while I'm working on it, why not take a few photos and make a How To about colour-changing in crochet. I know I for one was making a mess of any stripey project I came across before I figured this out, and haven't looked back since. Stripes are awesome when done right. When done wrong, they're a mess. You want a smooth transition, no colour-hopping, no half-green, half-red stitches and this is easy to achieve when you follow a few simple steps. Changing colour begins with the last stitch of the row, not the first stitch. 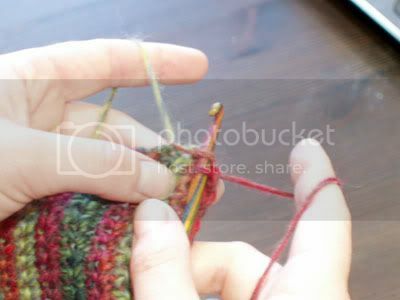 Using double crochets (US single crochet), start your last stitch. 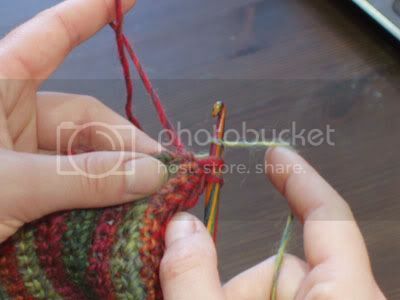 You're now ready to embark on the last yarn-over and pull through to complete the stitch. This is where you loop the green over the hook instead of the red. This leaves you with your new colour on the hook, ready to chain and turn to start your new row. 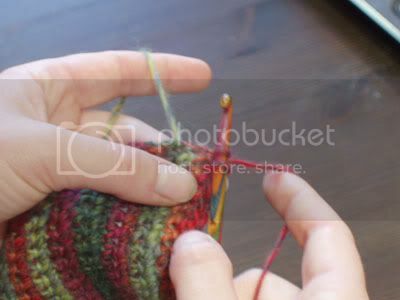 The same technique can be used for any stitch in crochet. 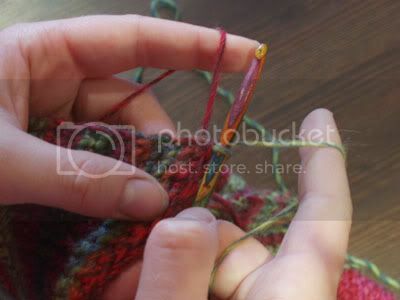 Just ensure that the colour change happens on the LAST yarn-over and pull through of the stitch. Love it. Very helpful tips. Bookmarking!